Use the stylus to drag and rotate pipe panels into place to divert fuel to a rocket's engines as it voyages into space. If you divert the fuel into just one side of the rocket then it will travel diagonally rather than straight, so it's important to keep the rocket on course. In Mission Mode, you have to solve a series of puzzles to help the rocket reach its destination within a 3 minute time limit. 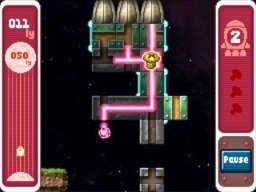 In Puzzle Mode you have to solve puzzles using as few moves as you can to earn medals.